What I love about that sentiment – and about Rachel in general – is that she embraces questions of all kinds. If you’re familiar with her writing, you know that. It’s something of a theme in her books. 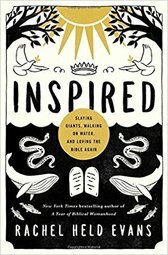 Her latest book, Inspired: Slaying Giants, Walking on Water, and Loving the Bible Again, is no different. Even though Rachel is not a scholar, don’t be fooled. As with her other books, Rachel’s scholarship is evident here. Inspired is well-researched and draws from a variety of Bible scholars and experts, although not many whom conservative Christians will recognize as legitimate. Disclosure: I received a free copy of Inspired from Nelson Books in exchange for a fair and honest review.